As a follow-up to my previous essays on visualization, in this article I will share select photographs made on film with a detailed description of the thought process, the choice of tools, and technical considerations that were involved. I have chosen two starkly different photographs (both landscapes) to discuss. I hope that these photos with the accompanying narrative will prove interesting and helpful to beginning film photographers and perhaps guide more experienced photographers in advanced techniques and approaches. Of note, Photography Life contributors John Bosley, Laura Murray and Vaibhav Tripathi have previously written excellent essays on film photography that may also be of interest. On three key topics (film scanning, the view camera, the Zone System) during the discussion, I will briefly digress to provide additional background, as I feel that will help the reader understand the concepts and technical processes. A complete discussion of these concepts is beyond the scope of this article, but I have made an effort to provide references at strategic points that should provide a more comprehensive treatment. Although some of the principles and tools here are applicable solely to the film photographer, the underlying process of visualization applies equally to photographers of analog and digital formats. I should emphasize that the construction of each photograph below was based on the process of visualization and the intersection of light, artistic vision, and skill. After humble beginnings in learning the process of film and visualization nearly five years ago, I currently use a wide variety of formats and film stocks. In particular, I use small, medium, and large formats with both color and black and white film. I do not discriminate. I tailor my choice of tools to the objective and that will permit me to take command and control of the situation at hand. For example, I use 35mm for moving people and objects, large format for static objects (stills, landscapes, portraits) and high technical image quality, and medium format as a practical compromise among bulk weight, image quality, and in the face of rapidly changing light where work flow speed is of the essence. Although the choices of film emulsions have diminished significantly over the past 10 years, there are still a plethora of excellent professional and consumer film stocks from which to choose. This year, based on aesthetic, process, and technical considerations, my tools of choice have become large format black and white sheet film in the 4 x 5” and 8 x 10” formats and the view camera, although I still immensely enjoy roll film and color film. The merit of these choices will become manifest in the descriptions below and on the second page of this article. So, let’s start with this first example – a landscape. I made the photograph below last summer during a hiking trip to the Hoh Rain Forest in Olympic National Park in Washington state. 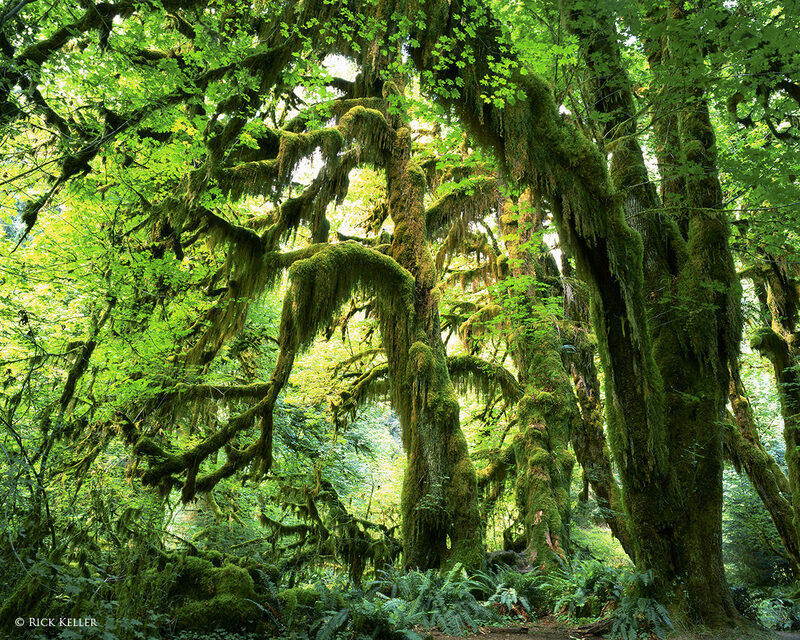 For those who are not familiar with this area, Olympic National Park and its beautiful rain forests are one of the hidden treasures to explore in the US. It is a bonanza for hiking, camping, wildlife photography, and landscape photography. This photograph represents one of the more classic and beautiful sites within the Hoh. I chose this photograph because of the visual mood it evokes, the interesting lighting, and the challenging approach to exposure. This was actually my first visit to this park. During my research of this park, I had heard and read all the positive reviews from fellow hikers and photographers. I had seen the photographs in magazines and on the internet. But, even those accounts could not do justice to the striking beauty and pristine mood that I witnessed with my own eyes. The day before I set forth on this modest hike, it had rained. During a break in the weather around mid-morning, I set foot on the trails. Aside from the annoying mosquitoes, I had never felt more at peace with nature. The mood was uplifting, the air was clean, and the sights mesmerizing. Trekking through this rain forest felt like I was in the midst of Middle Earth. Beautiful, yet surreal… During the late morning, sunlight was starting to break through, and as I came across this turn in the trail, I was stunned at the site of the shaggy moss-laden maple trees and surrounding ferns. I was so taken aback from this view that I stopped in my tracks, dropped all of my gear, and sat down to admire this beautiful site. Following a fresh rain, the contrasty backlighting made the greens *pop*! I had to work quickly, because the sun would soon create excessive (and uncontrollable) contrast. For this scene, I instinctively knew what film to capture the essence and physical attributes at play: Fujichrome Velvia 50. Also known as transparency film or color reversal film, Velvia 50 has been a legendary selection for landscape photographers for over 25 years. This slide film is a joy to use because it can create vivid, contrasty, saturated, sharp, and highly 3-dimensional images. The weaknesses of this film are that the exposure latitude and dynamic range are narrow compared to print film, which make it technically challenging to manipulate with difficult lighting. Yet, when the photographer is in command and control of the light and his/her technique, Velvia 50 delivers the goods. My other tool choices for this shot were my medium format camera, the Mamiya 7 II and a wide angle lens, the Mamiya 43mm f/4.5 L. In the 6 x 7 cm format, the 43mm focal length provides an angle of view that is similar to that seen with a 21mm lens in the 35mm format. Due to its light weight, relatively small size, few bells and whistles, and superb image quality, this camera has become my “go-to” camera for hiking over the years. This system is so good that it even rivals the quality of 4 x 5” film. It has never let me down. My goal with this exposure was to capture the quintessence of the intersection of light, land, and vivid color. After framing the scene with my composition card, I set the composition though the external viewfinder. I set the hyperfocal distance to 7 ft and stopped down the aperture to f/16. For filtration, I used a polarizer filter to remove the some of the glare from rain droplets on the foliage. And to adjust the white balance, I used an 81A warming filter. In this scenario, the rational for the warming filter is two-fold. First, it can be used as a creative tool for adjusting the color temperature of the ambient lighting to adjust the color balance on the transparency. Secondly, based on experience with this film, Velvia 50 tends to be a “cold” film, meaning that although it is a daylight balanced film, it tends to give a “cooler”, or a more blue, rendition to the scene, especially when used in heavily shaded areas such as in this scene. White balance in film photography is a very interesting topic that merits its own discussion in another article. In general, shadows are predominantly lit with blue light, especially from sky light in open shade. If the photographer does not take action to filter out this excessive blue, then the resulting scene has the potential to be rendered cold. On the other hand, if the photographer desires a cool mood, such as in a winter scene, for example, then no correction would be needed. Comparatively, the 81A filter is a low-strength warming filter, followed in increasing strength by the 81B, 81C, and the 85 series. For determining the proper exposure for both slide and print film, I practice a modified version of the Zone System, which was pioneered by Ansel Adams and Fred Archer in 1939-1940. A discussion of this concept is far beyond the scope of this article, but essentially the Zone System is a systematic approach to determine the proper exposure and development of film for a given scene. It is based on the luminance values of a scene that are categorized into standardized zones of exposure from “zero” to “ten”, with pure black representing Zone 0, pure white representing Zone X, varying degrees of shadow detail and tonality from Zone I through IV, midtones at Zone V, and varying degrees of highlight detail and tonality from Zone VI through IX. In practice, Zones II through VIII are the most useful, as those represent the range of textures that we see on our subjects. For those interested, I would highly recommend reading Fred Picker’s book, “The Zone VI Workshop“, which provides a simplified treatment and application of the Zone System. For the pure technical analysis and original description, Ansel Adams’ landmark book, “The Negative: The Ansel Adams Photography Series 2” is a must read. With regards to the exposure strategy for this scene, in stark contrast to print film, the imperative in slide film photography is to expose for the highlights. Due to slide film’s tight exposure latitude, if the highlights are overexposed, then that detail is essentially permanently lost. Of course, there are exceptions to this strategy, in particular if there are weak highlights in the scene or if the highlight detail is of no interest to the photographer. For this scene, I desired to preserve as much highlight detail as possible in the backlit foliage. To this end, I metered the highlights in the foliage to the middle left of the frame and placed those high values in Zone VII and let all other exposure Zones fall into place. A priori, I decided to leave my spot meter at home to reduce the bulk weight of my gear and use the native spot meter in my camera. A *critical* principle in which a photographer must be in complete command in order to correctly set and interpret a spot light meter is that *any* light meter (either within the camera or an external hand held meter) automatically will yield an exposure value that falls in Zone V (midtones), regardless of whether the scene is brightly lit or dimly lit. This is what a light meter is designed to do by default. It is the photographer’s responsibility to *override* that meter reading in order to appropriately expose the Zone of interest. This cannot be overemphasized enough: a light meter sees one thing, and only one thing, and that is Zone V, or the middle of the Zone scale. This is where the skill of the photographer is paramount, especially when using slide film, which is unforgiving with exposure errors. On the other hand, if the exposure Zone of interest happens to fall on Zone V, then of course the photographer would not need to override the meter. There are many ways in which the photographer can override the meter, depending on whether he/she is using a hand held meter or the camera’s meter and on the characteristics of the individual dials. For my particular camera model, I can only adjust exposure compensation from -2 to +2 in one-third stop increments, which does not leave much leeway to account for multiple filter factors and exposure compensation. There are easy tricks to solve this problem. If I have multiple filter factors, I will typically enter those factors into the film speed dial, which effectively “tricks” the camera meter into exposing for a “slower” film speed. For exposure compensation, I will enter those values into the exposure compensation dial. Alternatively, one can mix and match these settings. It is very simple. As long the photographer is consistent with this approach, then the end result should be the same. So, returning to this exposure, since I desired to place the brightly lit foliage in Zone VII, I dialed in +2 exposure compensation into the exposure compensation dial to deliberately override the meter, which will automatically want to bring the exposure down to Zone V. For both the rated film speed (exposure index 40) and the filter factors for the polarizer (+1⅔ stop) and the 81A filter (+⅓ stop), I entered those values into the ISO dial by decreasing the box speed of ISO 50 downward to account for these factors. Finally, I used aperture priority mode and requested normal development from the lab. Since I am not yet trained in developing my own film (nor do I have a dark room or optical enlarger), I have my film professionally developed at Northcoast Photographic Services in Carlsbad, CA, which provides excellent developing, scanning, printing, and retouching services. They do a superb job and service clients all around the globe. I have a great working relationship with my film technician, Scott, with whom I can *always* rely to make the appropriate adjustments to film development when requested. I highly recommend them. Thanks, Bonnie and Scott! For web display, I personally scan all of my 120 negatives, slides, and sheet film using the Epson V850 Pro flatbed scanner. Scanning is relatively easy, although it takes some practice to learn and adjust the settings. An excellent resource that I recommend for film scanning is Kenneth Lee’s tutorial on his scanning page. Mr. Lee is a brilliant and inspiring artist, an expert large format photographer, a gentleman, and very willing to help. Please, check out his web site, educational resources, and gallery. Thanks, Ken! The Epson scanner provides high quality images with an optical resolution at 6400 dpi, a scanning resolution of 6400 x 9600 dpi, and varying output resolutions as high as 12,800 dpi, although the best output is probably at 2400 dpi (this point has been the subject of debate with earlier models). For my 8 x 10 negatives, I use 2400 dpi; for my 4×5 negatives, I use 3200 dpi; and for my 6 x 7 cm and 6 x 4.5 cm negatives, I use 4800 dpi. Of note, flatbed scanners are probably not the best for scanning 35mm film. I always have my 35mm film scanned at Northcoast Photographic Services at the time of development, since they have a dedicated 35mm film scanner. Once the Epson scan is complete, I save the file as a lossless TIFF format. From there, one can import the file into the post-processing software program of choice. At this stage, I apply minimal post-processing, sometimes none. The rationale is that conventional “adjustments” that are commonly used in modern-day digital post-processing are “destructive” and have the potential to degrade the image. Thus, almost any manipulation made to the scanned TIFF file has the potential to make the image look less like film and more like digital, which is highly undesirable. Occasionally, I will make a slight contrast or highlight adjustment in Photoshop, sometimes “spot” the image to remove noticeable dust spots (which is a common problem with sheet film), and very often crop the image to adjust the aspect ratio. Otherwise, I make every effort possible to get the exposure right to precisely record shadow detail, appropriately develop the film with good communication with my film technician to appropriately bring the highlights into the Zone of choice, and then properly scan the negative or slide. After making any minor adjustment or crop, I will save the file as a lossless PSD master file. Subsequently, I can downsize the image to any resolution as needed for printing, typically as a JPEG file. Returning to this photograph, upon examining the side on the light table, the result was stunning: rich colors and contrast with an uncanny 3-dimensional appearance. It was almost as if you could wrap your arms around the maple trunks or reach out and grasp a fern leaf. I scanned the slide at 4800 dpi. The actual image dimensions of this particular 6 x 7 cm format are 56mm x 72mm (every such camera system will have a slightly varying long dimension). With this output resolution and film dimensions, the scan yielded a 144 megapixel image. In Photoshop, I made a slight adjustment to lighten the foreground maple trunk and then cropped the frame to a 5:4 aspect ratio. As a historical point, for those who are not familiar with slide film, it is important to note that, traditionally, no web-based scanned image will ever do justice to the full resolution and 3-dimensionality of a transparency as viewed on a light table. Certainly, an ultra-high resolution drum scan could extract more detail, but it still would not duplicate the 3-dimensionality. As the name implies, slides were also designed to be *projected* onto a viewing screen, where the full resolution can be enjoyed. Sadly, such projectors are no longer in production and are scarce on the used market. Next, staying within the realm of landscapes, I chose the following photograph to share and discuss. 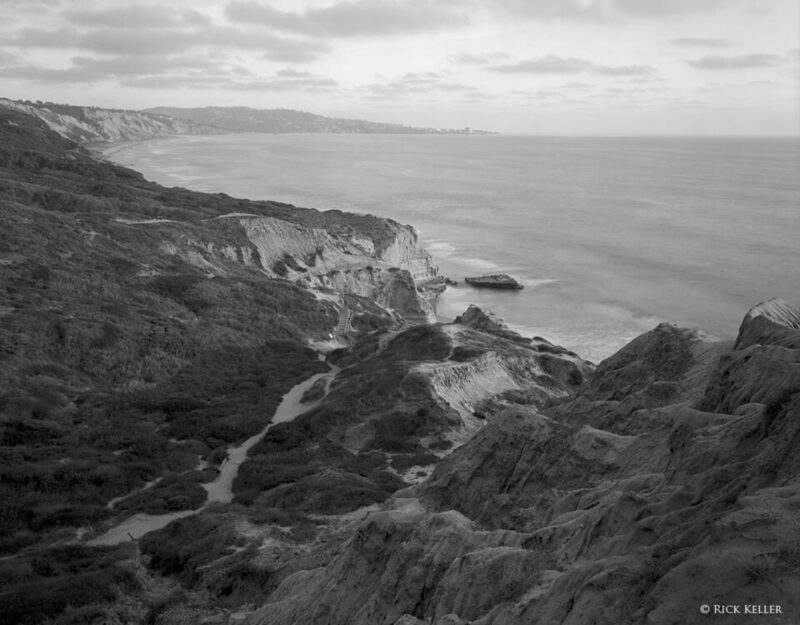 I made this photograph last month at my favorite place to hike and photograph, Torrey Pines State Natural Reserve. For this photograph, I chose an overlook, Yucca Point, which provides a classic view of coastal San Diego. I desired to construct an image that captures the quintessence of the intersection of light, land, and sea at sunset and to record a continuous plane of textural detail and tonality from near to far. Previously, over the past 2 years I had made attempts to photograph this view at sunset, but my exposures had been disappointing because of either harsh and inordinately contrasty light, or flat light due to overcast skies. What I desired was modest cloud cover with a patch of unidirectional sunlight near the horizon to impart a *touch* of contrast to the landscape. I dedicated a stretch of days to scout this site and await the right conditions. Although this was not quite the light for which I was searching, what Nature provided was good enough. The first photograph below is a scout photo made with my iPhone to illustrate what I was seeing through my composing card. To make this photograph, there were multiple considerations, but the key ones were the quality of the light, the contrast, the near-far relationship, and the plane of focus. In terms of the weather conditions, it was near sunset. The skies were mostly cloudy, but sunlight was intermittently bathing the landscape. I set up my camera at a near 90 degree angle to the incident light, which was coming in low near the horizon to the west. As the cloud cover evolved, the contrast alternated between low and moderate; moderate contrast was what I sought. The landscape had structure of interest in the foreground, middle ground, and distance that I wanted to render in sharp focus. With those considerations in place, I chose an 8 x 10” format, the Tachihara 8 x 10 field view camera, and Kodak Tri-X film, which is a legendary film stock in terms of its tonality, aesthetics, moderate contrast, and wide exposure latitude and dynamic range. Briefly, for those readers who are unfamiliar with a view camera, this type of camera offers the photographer the advantages of controlling the plane of focus and the shape of the perspective by virtue of the manipulating planes of the subject, lens, and film without having to excessively stop down the lens aperture to control depth of field, in stark contrast to the conventional “rigid” camera, in which the aforementioned planes are parallel to each other and fixed. For additional background on this type of camera, there are a plethora of print and internet resources on this topic. To frame this perspective, I chose a moderately wide angle lens, the Fujinon-A 240mm F/9. In the 8 x 10” format, this focal length provides an angle of view that is similar to what is seen with a 32mm focal length in the 35mm format. To focus the view camera, the photographer must first decide where the plane of “best focus” lies. Given the detail that I desired to capture lied in the near, middle, and distant landscape, the plane of “best” focus lied on a plane between the foreground rocks, the bluff in the middle, the distant bluff to the top left. For the far focus, I chose the bluff at the far upper left instead of the more distant peninsula because I desired precise detail on which to set the far focus. And this is where the fun begins! I employed “movements” of the view camera (e.g., adjusting the film plane-to-lens plane distance with the focusing knobs, tilts, and swings) to achieve the plane of best focus on the focusing screen (the ground glass) and then stopped down the aperture to f/45 to achieve the optimum depth of field. A complete description of view camera focusing and movements and depth of field considerations are far beyond the scope of this article. However, it is wise to state here that the underlying principle of view camera focus is based on two important laws: the Scheimpflug Principle and the Hinge Rule. Basically, these principles dictate that the plane of best focus is achieved when the photographer adjusts the view camera such that the subject plane, the lens plane, and the film plane intersect at well defined points and lines. The geometric analysis is interesting, complex, and difficult to grasp at first. There are some things that I still do not understand about the geometry, and the calculations are exceedingly difficult and impractical to apply in the field, especially when trying to capture the light and time is of the essence. The depth of field considerations are even more complex – I will not even go there. Nevertheless, for those who are interested in the pure technical analysis, I would recommend reading Harold Merklinger’s numerous publications (available in PDF) on his website, including “Principles of View Camera Focus”. Mr. Merklinger, by the way, is an engineer and a pioneer in view camera geometry. To simplify matters, many view camera photographers use well-defined and vetted checklists to efficiently focus the camera. There are several good ones out there, but I prefer Howard Bond’s elegant “Check List for View Camera Users”. Returning to the photograph, once I achieved the desired focus, I turned my attention to light filtration and metering. One of the more important tools that black and white film photographers use in the visualization process are contrast filters, which can be used to selectively separate colors and adjust contrast. Surprisingly, some photographers do not believe in using them, preferring to adjust contrast during the development of the film and subsequently and at the printing stage. Other photographers heavily rely on these tools. Personally, I often make use of contrast filters, but I use them selectively when there is a specific effect that I wish to achieve. For landscapes, contrast filters can be used to lighten or darken the sky, foliage, and rocks, as well as increase the contrast between clouds and the sky. For this scene, I chose not to use a contrast filter. The only filter that I used was a polarizer to cut down the glare from the ocean. For the exposure strategy, the guiding principle for print, or negative, film is that the photographer must expose for the shadows and develop the film to adjust the highlights. This is a *big* one, because if shadow detail is not captured on the negative, then it will not appear on the print. It’s that simple. Certainly, once a negative is made, the photographer can dodge and burn at will, but shadow detail will have remained fixed on the negative. With regards to capturing shadow detail, the most important decision for the photographer (which has been subject to debate for many years), becomes into what zone should the shadows be placed. For years, photographers have argued that shadows in landscapes should be placed in Zone III, whereas other have argued that they should be placed in Zone IV. So, what is the correct answer? For me, it is easy: shadows should be placed where ever the photographer wants them to be placed. It is that simple. As with many other aspects in photography, there should not be hard “rules” about anything. If the photographer wishes to have ample shadow detail in a scene, then exposing for shadows in Zone IV would be an excellent choice. On the other hand, if the photographer desires little detail or tonality (or perhaps none) in shadowed areas, then exposing at a lower Zone would be appropriate. Again, it all comes down to the process of visualization. Whatever construct the photographer visualizes in the mind and wishes to translate into the final image, then he/she should use whatever exposure strategy and methods that are necessary to achieve it, even if it cuts across the grain of “conventional wisdom”, which can sometimes exert an unfortunate drag on creativity, in my humble opinion. 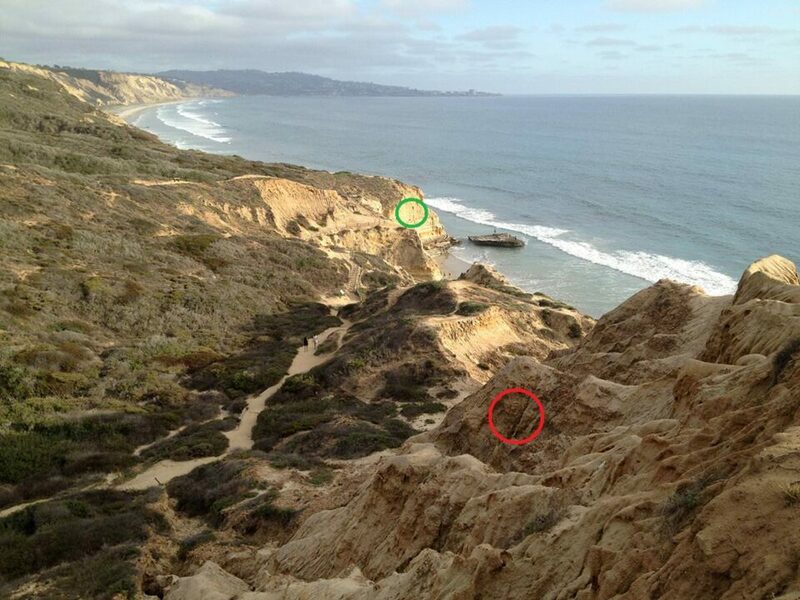 For this scene, I desired to retain maximum detail in the shadowed areas in the foreground rocks, illustrated by the “red circle” in the iPhone photograph; this would require that the shadows be placed in Zone IV. The luminance of these rocks were very nearly in Zone IV as is. For development of the highlights, one must determine where they fall in the scene and where they should be developed on the negative. Here, I desired to keep the highlights on the sandstone rocks present in the middle of the frame as is, in Zone VI, illustrated by the “green circle”. (Of note, in between taking the iPhone snapshot and the view camera exposure, the lighting changed such that the intensity of the light diminished from that shown in the iPhone photo). Therefore, using my spot meter with the film exposure index (I chose the box ISO speed of 320) and the filter factor for the polarizer (+1⅔ stops) dialed in, I metered the shadows, which gave a luminance value that, once again, automatically falls on Zone V by default. Then I rotated the EV dial to set the Zone IV exposure and read off the shutter speed. Since the highlights were already were I desired them, I requested normal development from the lab. Since the usable area of an 8 x 10 negative is 7.75 x 9.75”, at 2400 dpi the scanner provided a 435 megapixel image, which is plenty. 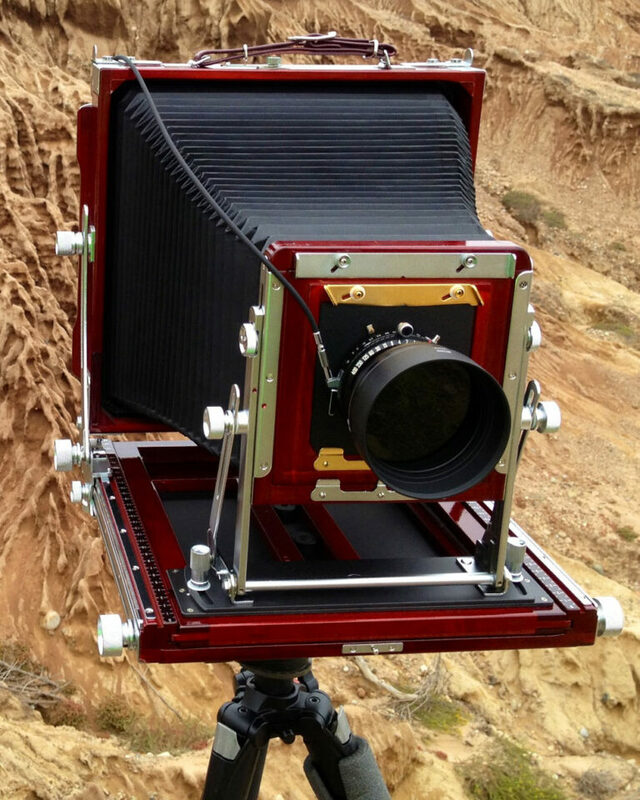 For my purposes, higher resolution scanning for 8 x 10 film would be overkill. In Photoshop, I made a modest adjustment to the contrast, removed a few dust spots, and cropped the image to a 5:4 aspect ratio, As the photograph reveals, there is modest, but pleasant, contrast across the landscape, ample shadow detail in the foreground rocks, good sharpness across the frame, beautiful textural detail from near to far, and adequate depth of field. Overall, I felt that the image nicely captured the beauty and mood of the scene as I had visualized it. I hope you have enjoyed this article on film photography and visualization. In the next sections of this article, I will share additional photographs (architecture, more landscapes, close-ups, color negative film exposures, 35mm exposures), analysis, educational references, and concluding remarks. Please, stay tuned. “The Negative: The Ansel Adams Photography Series 2”. Ansel Adams. “The Zone VI Workshop”. Fred Picker. “Beyond The Zone System”. Phil Davis. “Principles of View Camera Focus”. Harold Merklinger. “View Camera Focus and Depth of Field: Part I”. Harold Merklinger. “Technical Books on Photography”. Harold Merklinger. “Check List for View Camera Users”. Howard Bond. Rick Keller is originally from Texas but now resides in California. He is an avid hiker, jogger, nature lover, and outdoor photographer and immensely enjoys travel and culture. Rick considers himself a life long student of the art and history of photography. Deep inside he is a burgeoning visual artist who has chosen the camera as his paint brush. He takes pride and joy in educating his fellow beginning photographers to enjoy the aesthetic and technical aspects of creating an image. With more experience and opportunities in photography, Rick is enthusiastic about exploring more deeply aesthetics and his creativity, refining his direction and skill, and expanding his portfolio. You can visit his site and his gallery here.